Always Aubrey: Straight No Chaser, 2nd Year! Straight No Chaser came back to the Ryman, so friend VB and I decided to anniversary last year's outing and got 3rd row seats in the Mother Church. I love the Ryman. I don't go to many concerts, mainly because I can't understand paying so much money to be in an arena where I can barely see the act. 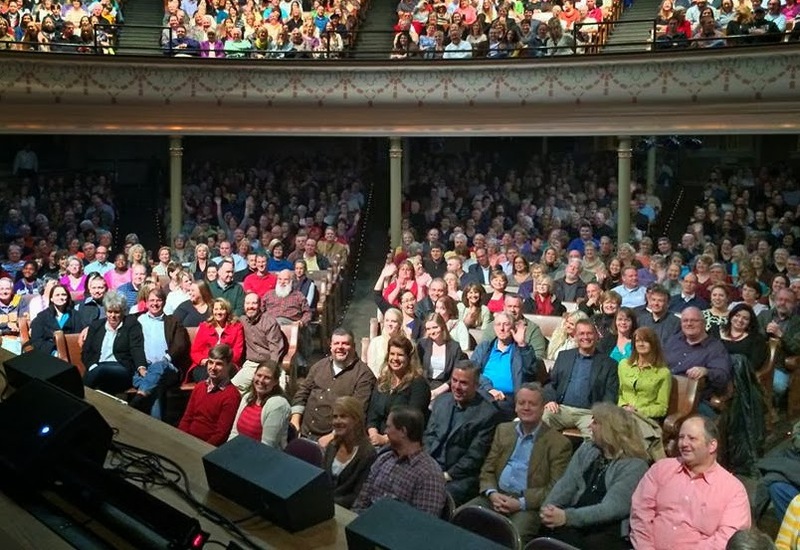 At the Ryman, it's such an intimate venue; even the "cheap seats" have great exposure to what's going on. SNC actually had an opening act this time, Caroline Glaser. She was on Season 4 of The Voice apparently, and she has a great soulful voice. Kind of a younger Nora Jones thing going on. It's been a while since I've heard such a good voice live that didn't sound overproduced. I'm interested in seeing if she makes it big. SNC had a great show. They had some old favorites for sure, but I loved the new mash-ups like Blurred Lines. They are hilarious and talented and entertaining... even if you *think* you're too cool for the awesome sound of a cappella. Our only complaint? We wish the 2nd set was longer (of course) and that we got more Christmas music. Though in retrospect, last year's concert was in December... so maybe that's why we got so much Christmas stuff vs. this year. They always take some photos of the crowd... can you spot my dorkiness waving amidst the middle-agers? Ha! Where's Waldo Aubrey? And do you see the guy that looks like Santa Claus too? The show was amazing as expected. I just can't understand how they can make such awesome music with just their voices. A cappella takes such a good ear, talent, and more... you gotta give them props, people. It's better than Pitch Perfect. P.S. I am super proud SNC started in my hometown of Bloomington, Indiana! I always yell a "Go Hoosiers!" during the show at some point. Because I'm an uber nerd. P.P.S. Pentatonix (of The Sing-Off!) are coming to the Ryman in March and we already have our tickets! Did you know there was an SNC cruise and at least 2 years of an SNC conference in Vegas? Richard got us tickets to see Pentatonix for my birthday, I'm excited! Yay a cappella! I knew you'd be seeing Pentatonix, you love them like I do! And OMG, was SNC really that big that they could headline a cruise and conference? Are there crazy SNC super-fans? Okay, I FREAKING LOVE SNC! But I'm so jealous that you also got to see Caroline Glaser! She was my favorite on that season! Omg! So jealous! It was a great show; I highly recommend seeing them while they're on tour. And Caroline was really great and super nice and the meet and greet after. So young, too! I'm so jealous. I really wanted to go, but time got away from me and I missed it. When I was in college at MTSU like circa 2001, one of my HS classmates who went to IU was dating one of the then members..I remember at the time thinking it was so odd how acapella was so big at another school. Now it is like THE THING! Personally I love a capella, so much so that weekly I try to convince my boyfriend to join a group. He cannot sing, but he can do vocal percussion incredibly well....without coming off like a white boy beat boxer. He always dashes my dreams. Also, although loving the art- I hate Pitch Perfect. I thought I would love it, but it was a huge let down. Am I alone on this? You guys need to get tickets to Pentatonix in March!!! Tickets for the Ryman are only like $30. For real. The mainstream loves Pitch Perfect. I mean, even Rotten Tomatoes loved it. I enjoyed it for two reasons: 1) it helped bring back The Sing Off and made a cappella kind of trendy. 2) I had ZERO expectations going into the movie, because I knew if I did I wouldn't like it. I saw Skylar Astin on Broadway (and met him, got a pic) back in the day, and I am a fan of a few of the other actors in the movie. It's definitely a silly movie, but I enjoyed it in the way I enjoy Glee (even now) because it's just brainless and campy because MUSIC.